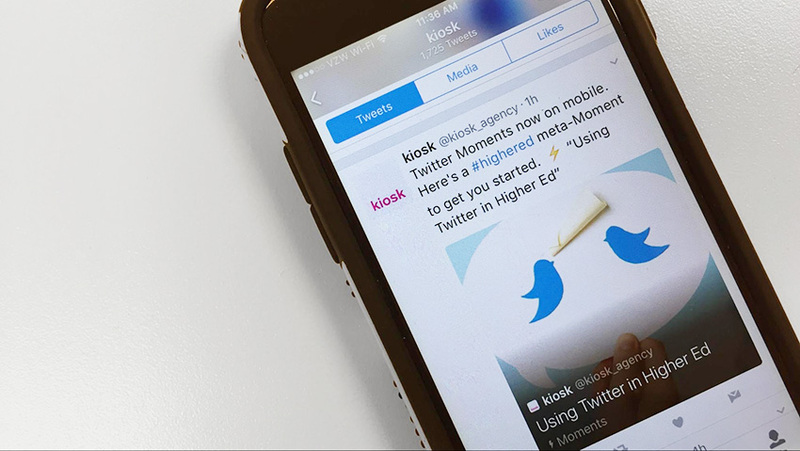 Twitter recently offered users the option of creating Moments—curated collections of Tweets—on mobile. Despite being rolled out to brands, influencers and now users, Moments haven’t gained the kind of traction we’ve seen on social media with Instagram and Snapchat’s Stories features. But they do offer the option to include content from various sources other than your own tweets. As we’ve covered in previous blog posts, social features like Facebook Live and Instagram Stories offer brands and higher ed institutions the opportunity to engage existing and potential students with authenticity on the platforms they already use. Moments provide an interesting mix of the more curated social media approach, along with the authenticity of including the most compelling content from other sources. For example, rather than simply retweeting what students are saying about a campus event, you can wrap the best tweets into a Moment, add a cover image (you can draw from images posted in the tweets you’ve included in the Moment, or upload your own), add text for context, then share it. Or collect tweeted articles on a relevant subject, like this somewhat meta-Moment that bundles some tweets about using Twitter for higher education users. For a comprehensive guide to building stories on desktop or mobile, check out Twitter’s own how to. A link to your published Moments appear on your Twitter page, alongside any lists you’ve created and, of course, your tweets. Think of them as playlists for content that was worth saving and sharing. For people in the higher education space, Moments can be an opportunity to add value to your followers’ social feed by providing better-packaged content, rather than simply retweeting things that resonate. Some content marketing advice focuses on the notion that you can utilize other people’s social content to your advantage, simply by resharing it. That’s somewhat true, but if anyone can recognize the value of telling a story using building blocks from a variety of sources, educators can. Moments is a tool for doing just that. So if you want to be a trusted source of quality content on Twitter, take a few Moments to tell a better story. For more ideas on how to reach your higher education audience, give Kiosk a call.